It’s time for another challenge at Freshly Made Sketches, and this week I have the pleasure and privilege of serving as the hostess. I have a pretty simple and clean sketch for you that I think would be pretty easy to dress up or keep super clean — however you want to use it. 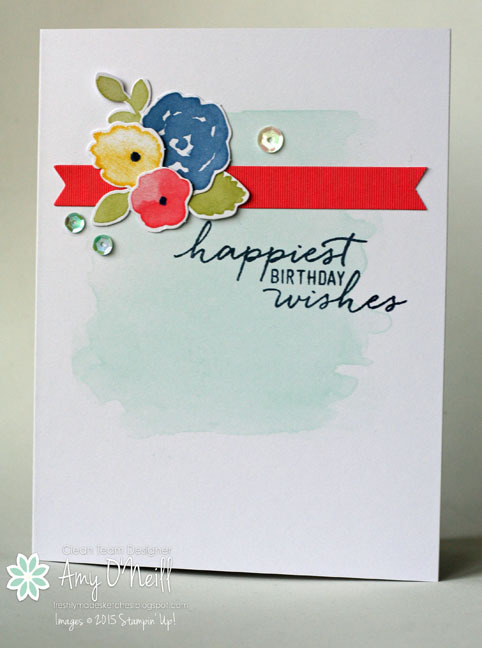 I pulled out my Watercolor Wishes card kit and used some of the element from the kit. This kit is amazing! I love everything in it, including the stamp set. I chose one of the card bases in the kit, which has a lovely Pool Party watercolor wash already on the card. The flowers and leaves are printed, die cut, and ready to go. All I had to do was arrange them. The Calypso Coral banner is a sticker, and the sequins were also included in the kit. 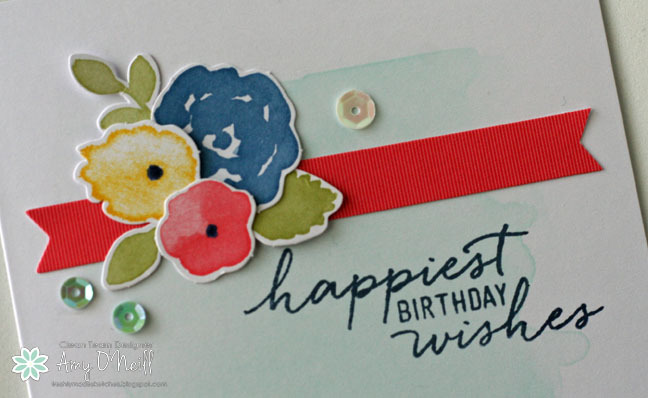 Actually, the only stamping I did on this card was the sentiment. Pretty easy, huh? I love how these kits give you great sample ideas, which you can follow to the T, or you can mix and match the elements and make your own cards however you want. I hope you’ll play along with the sketch this week. We love seeing what you create, and I’m looking forward to seeing how you interpret the sketch. You should head on over to the Freshly Made Sketches site to see what the design team made this week. They are inspiring and always amaze me.